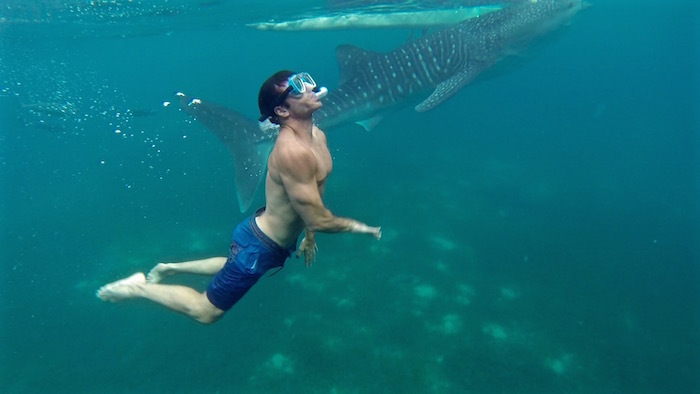 It’s always been a dream of mine to swim with sharks. Most people imagine being submerged in a protected cage surrounded by great whites. Well, that or standing in front of Mark Cuban presenting their latest product. 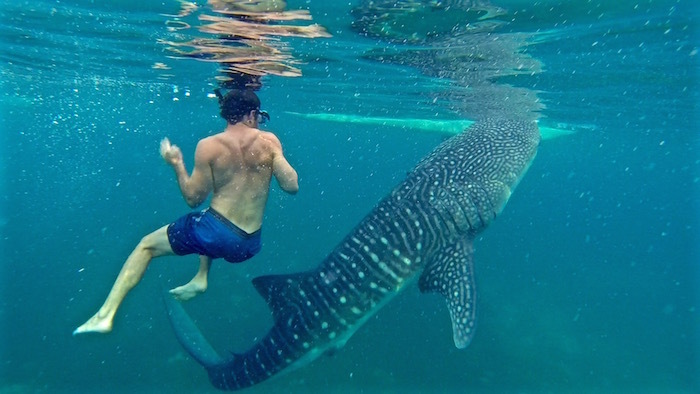 While prepping for my backpacking trip to the Philippines, I was excited to discover that swimming with sharks – more specifically whale sharks – was possible in the towns of Oslob and Donsol Bay. 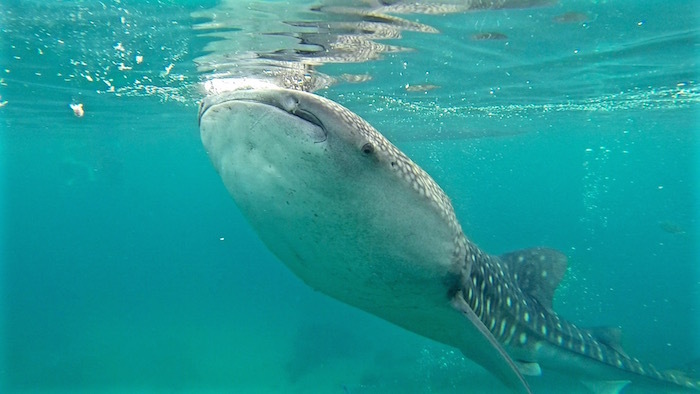 Geographically Oslob fit perfectly into my to do list that already included El Nido, Bohol and Boracay so swimming with the Oslob whale sharks was added to my Philippines agenda. Oslob is located on the southeastern tip Cebu, an island in the Central Visayas region of the Philippines. The closest international airport is Mactan-Cebu (CEB) right outside of Cebu City. 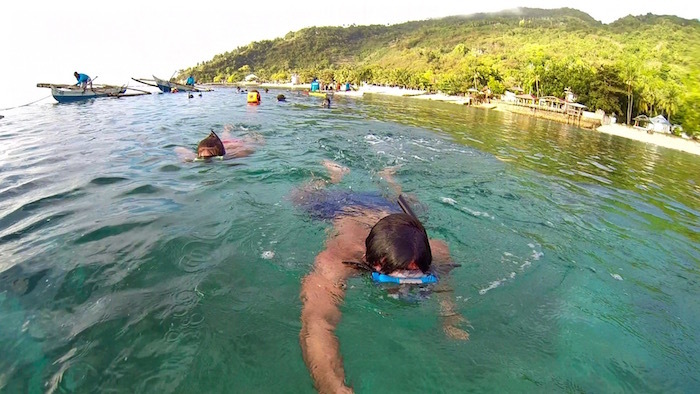 From Cebu City the most popular budget option to Oslob is a 3 hour bus ride from the Cebu South Bus Terminal. 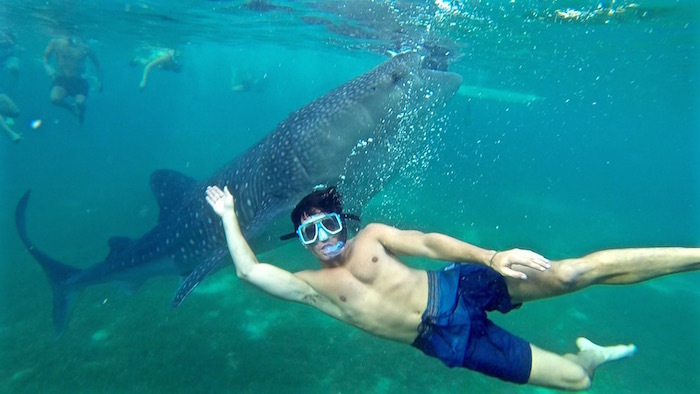 A lot of tourists make a day trip out of swimming with the Oslob whale sharks from Cebu City. I actually made a big loop during my trip in the Central Visayas region. I flew into Mactan-Cebu (CEB) from Manila and then traveled to Bohol via boat (one-way PHP400.00). 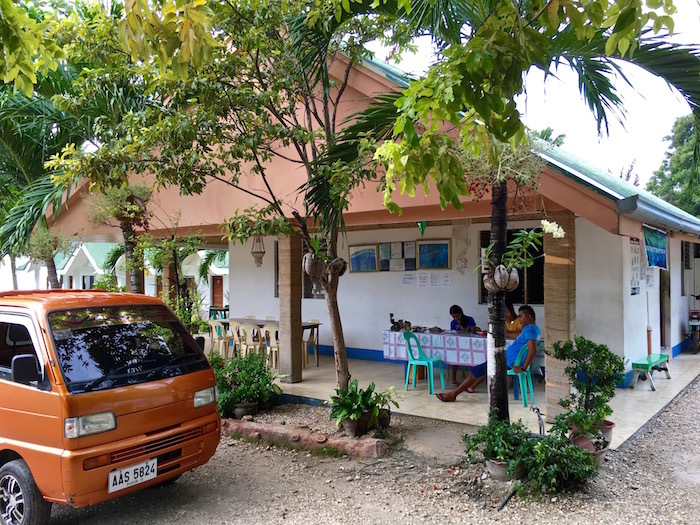 After exploring Bohol, I then took a 2 hour boat ride from Alona Beach to a drop-off point about 20 minutes north of Oslob. 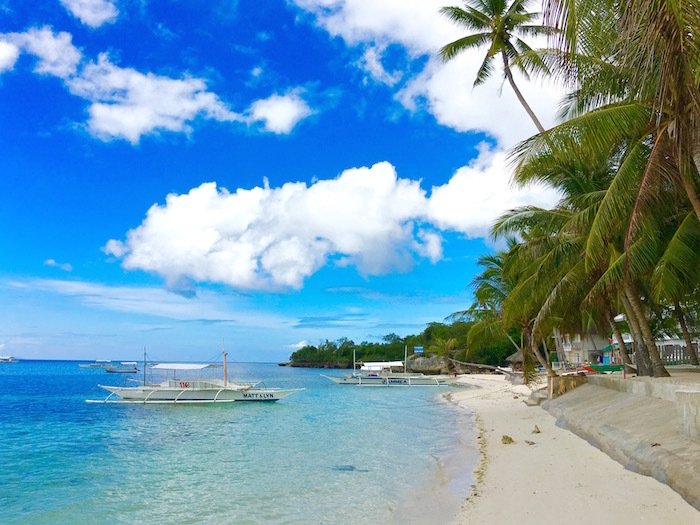 Boats leave Alona Beach early in the morning for swimming with the Oslob whale sharks, so try to book beforehand. The day before my whale shark adventure, my friend Morgan and I made a last-minute decision to spend the night in Oslob instead of staying another night in Bohol. Since we had missed the Alona Beach morning boats, we splurged to hire a private boat to take us in the afternoon (PHP1,850.00). 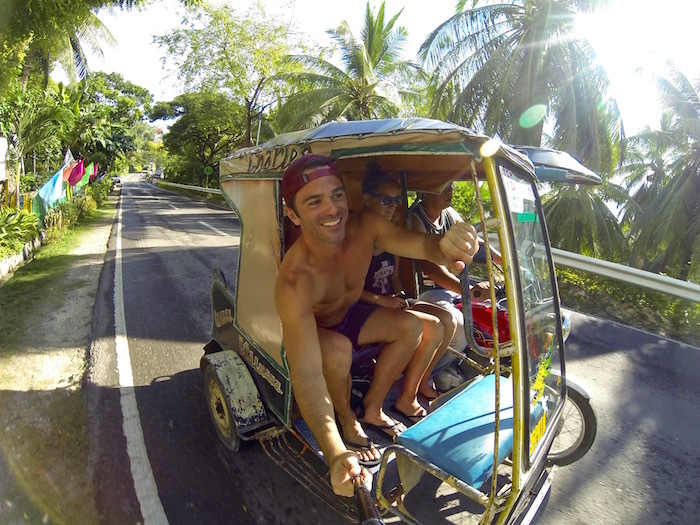 Once we arrived to our hotel we booked a tricycle (roundtrip PHP150.00) to pick us up at 5:30am the next day. 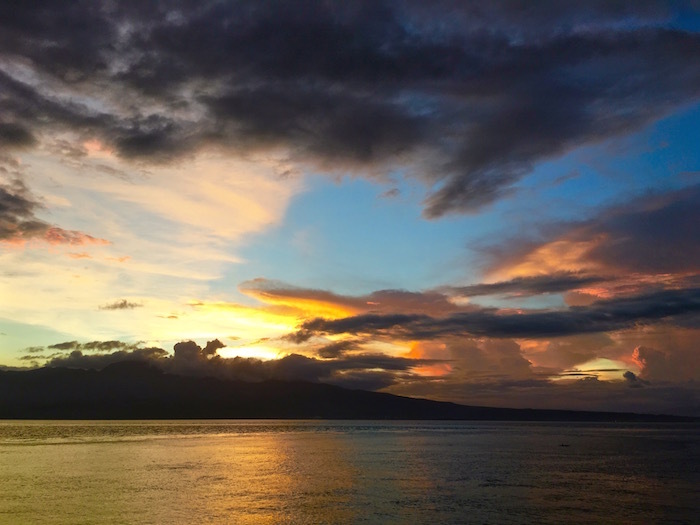 Travel Tip – The sharks start feeding at 6:00am, arrive early to be one of the firsts in the water. 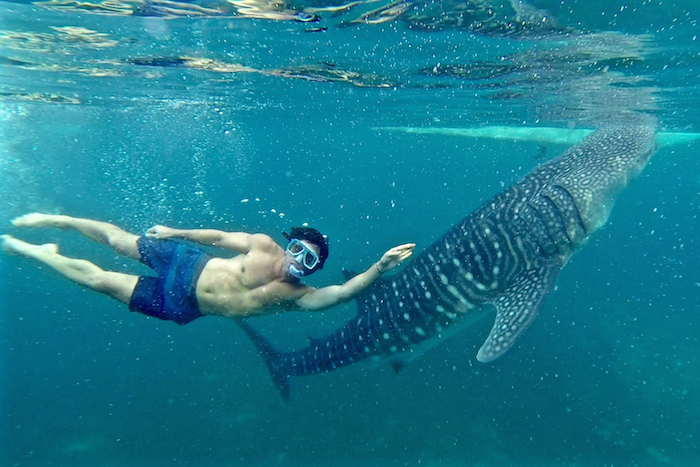 As soon as my alarm went off I bolted out of bed like a kid on Christmas morning excited for the Oslob whale sharks. At 5:30am we took our tricycle about 20 minutes to what I thought was the entrance. We were actually taken to a small outfitter where we paid our entrance fee (PHP1,000.00) and locked up our belongings. 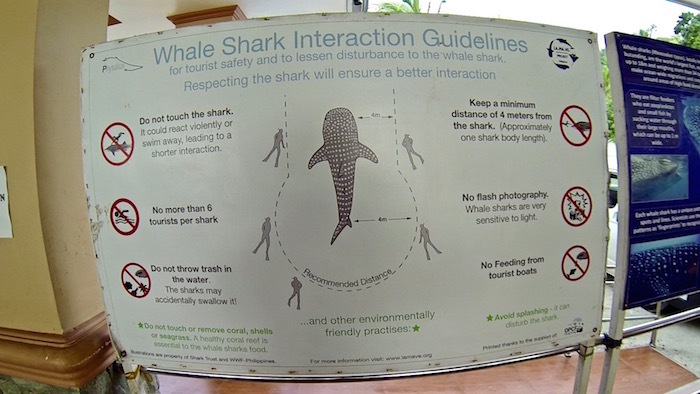 Our small group of four was then taken to the main entrance where we sat through a mandatory orientation about the “Whale Shark Interaction Guidelines” where we learned the rules and penalties for breaking them which included fines and possible jail time. After learning the rules, we were given lifejackets and guided to a boat. 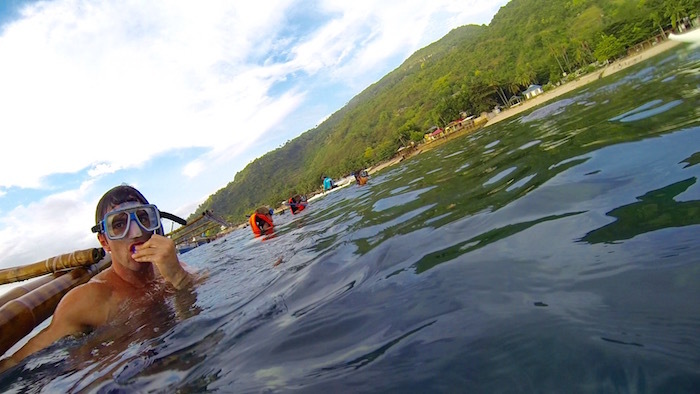 The guides then took us into the water and gave us roughly 20 – 30 minutes to swim with the Oslob whale sharks. The moment I saw my first shark, I was mesmerized! 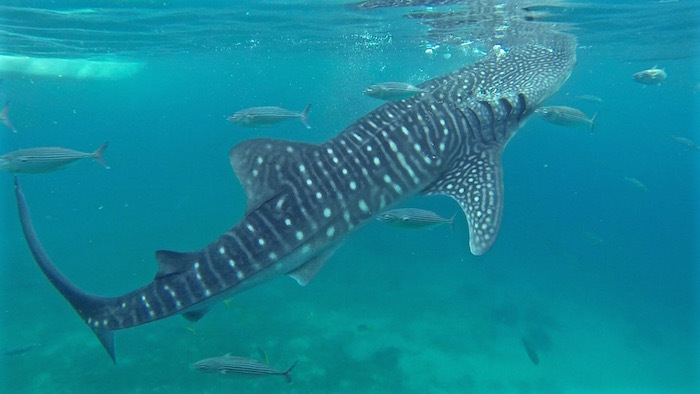 The whale sharks appeared prehistoric, it was as if I had been transported back to the Mesozoic Era — swimming with dinosaurs! 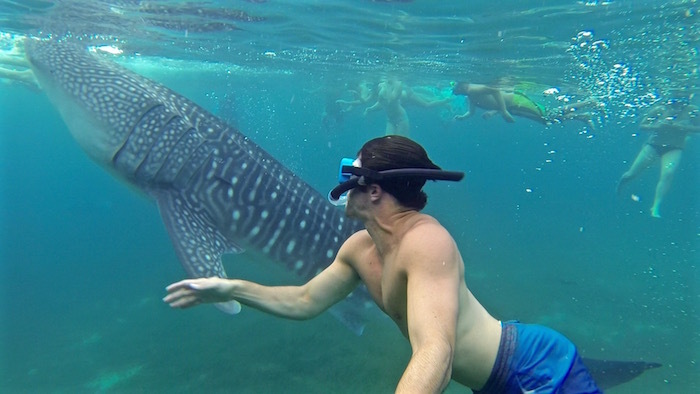 Being in the water with the whale sharks is incredibly surreal. 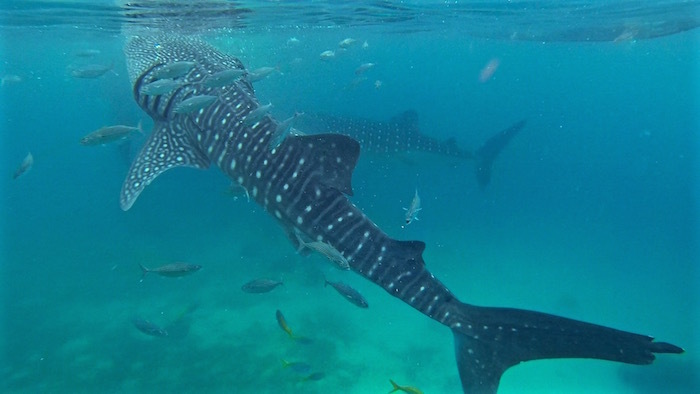 I was surprised to learn that these massive creatures are actually the largest fish in the world ranging from 18 to 60 feet in length and weighing up to 20 tons. With a face like a whale, body like a shark and temperament of my dog Pepper when he was 12-years-old, these creatures were the epitome of a gentle giant. As they swam around with their mouths open to take in food, I also swam around with my mouth open — amazed by mother nature. 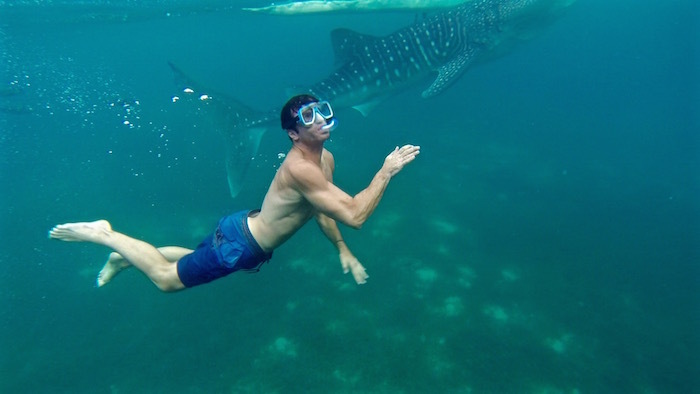 Having read some negative articles about the practices surrounding swimming with the Oslob whale sharks I had some hesitations about going. 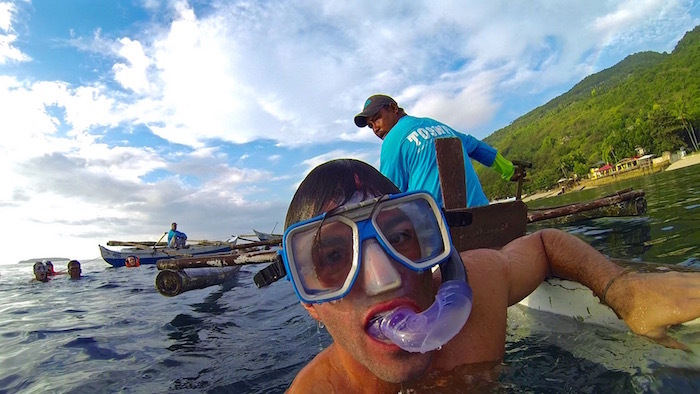 During my travels leading up to Oslob I made an effort to ask locals about it. I was happy to consistently hear that the regulations had improved over the years since it became a popular tourist destination. During my experience, I was glad to see tourists respecting the rules and the guides enforcing them both above and below the surface. Thanks to my friend Morgan’s mom, we were treated to a 2-night stay at Eden Resort as a holiday gift which became our tranquil oasis. 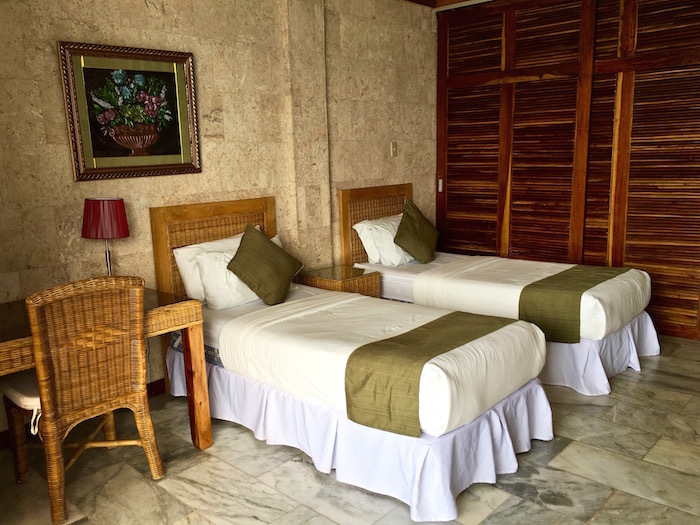 For anyone looking to stay in an upscale hotel with a mid-range price, stay here! 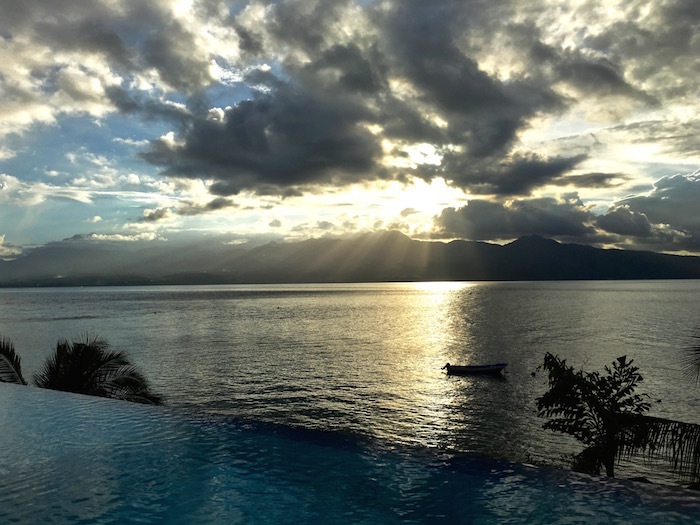 Some of our favorite amenities included the beautiful rooms with balconies, the infinity pool with a gorgeous view, the delicious food and the extremely friendly staff. 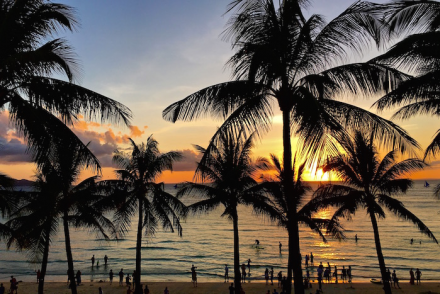 Before traveling to the Philippines I decided to do some Instagram research for inspiration. 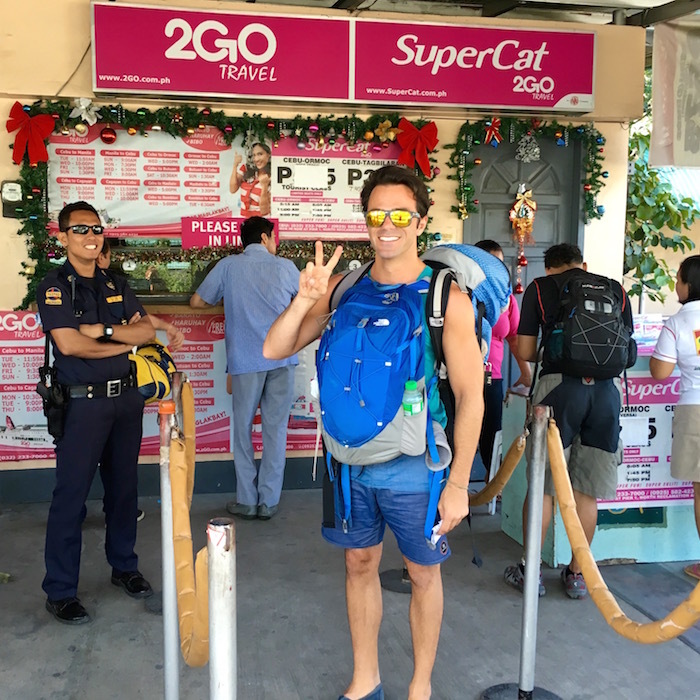 During my #Philippines stalking I came across travel blogging couple, Jenn and Jack. After looking at their instas and checking out their blog Who Needs Maps I sent them a direct message. Immediately, Jenn answered a TON of my questions and helped me plan the Cebu-Bohol-Oslob leg of my trip. I was so thankful that a stranger (who actually lived 10 minutes from me in LA) would take so much time to help a fellow traveler. 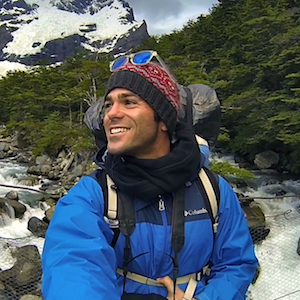 So lesson learned – it’s a small (travel) world out there and Instagram is a great travel resource! You never know who your Jenn might be so it never hurts to reach out and ask for travel advice. AW JUSTIN!!!!! “how did we meet” instagram! haha great hashtagging stalking! 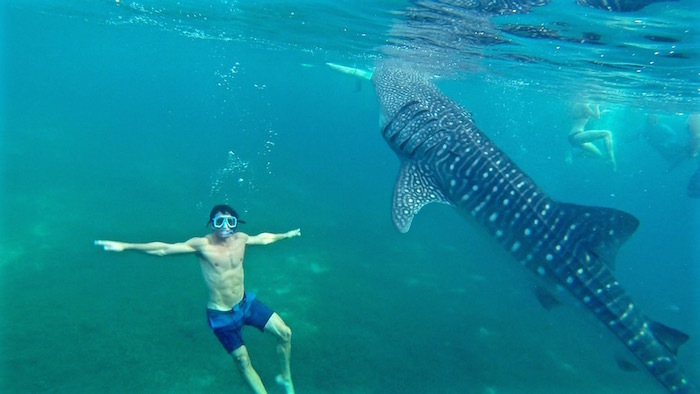 and glad you had fun swimming the whale sharks! I love that we met and became friends through Instagram! 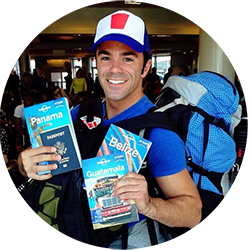 You helped me so much in my trip planning and changed the way how I view social media as a tool for traveling. Thanks! Awesome pictures!! 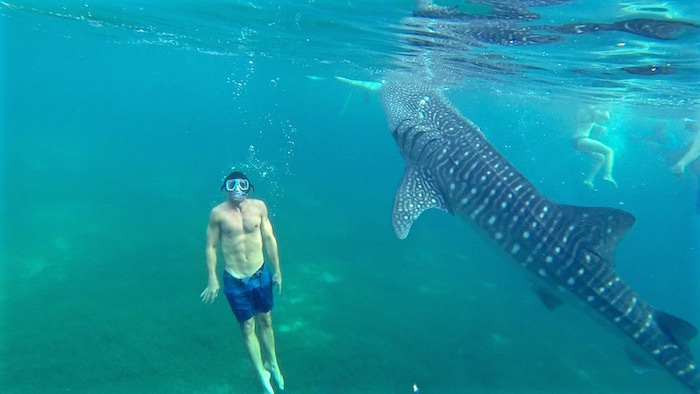 Totally fell in love with the idea of swimming with the whale sharks. And it got me wondering, does the enterance fee include boat ride/snorkeling gear/life jacket? Or did you have to pay extra surcharge for them? When I went the entrance fee included everything we needed. I am not sure if that has changed since. You will easily be able to find out once you’re there. This is a lovely experience. 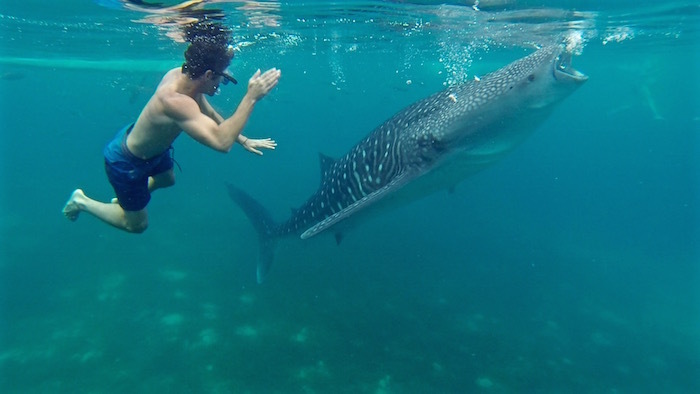 I’m sure that many where amaze with this friendly big whaleshark. 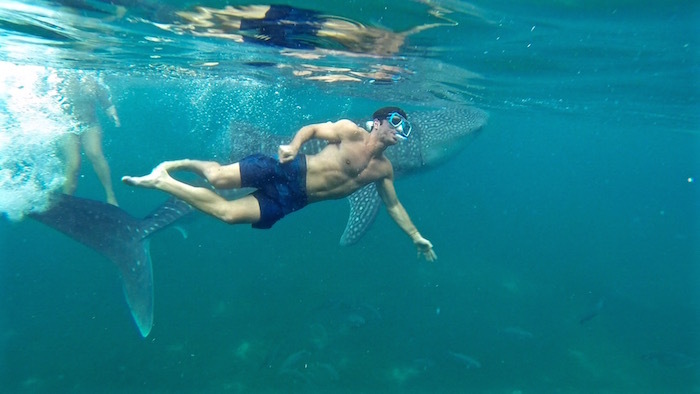 It is amazing to know that you can be really be close to these whalesharks. 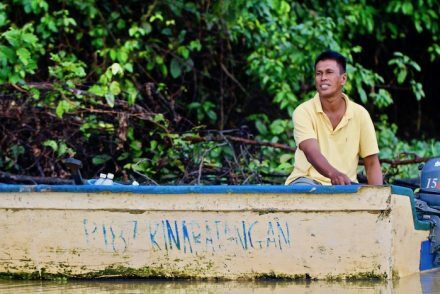 Thank you for sharing this beautiful pictures and story you have. We love you from Jhun from Cebu City Tour. Super helpful post! 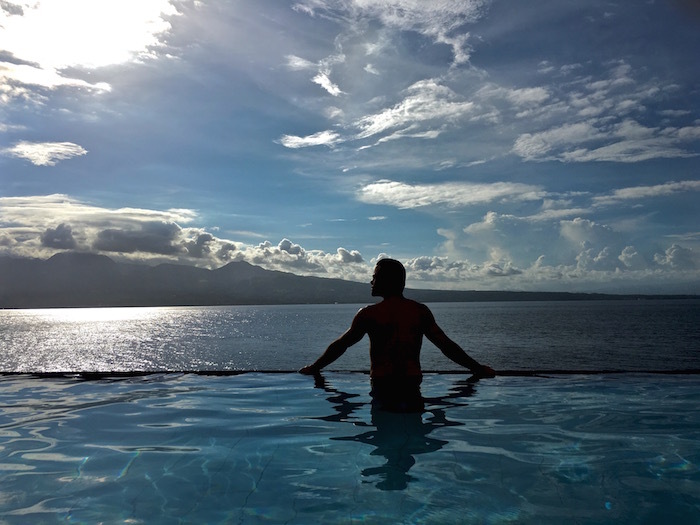 Trying to do the same triangle – Cebu, Oslob, Bohol. 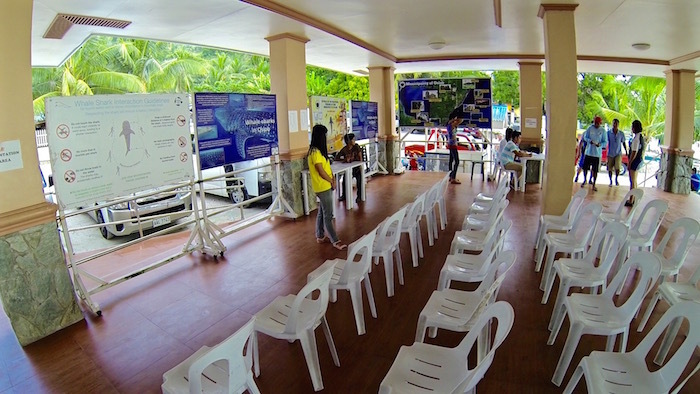 Having trouble finding information about getting from Alona Beach to Oslob (vice versa). Are there ferries, or all private hire boats? 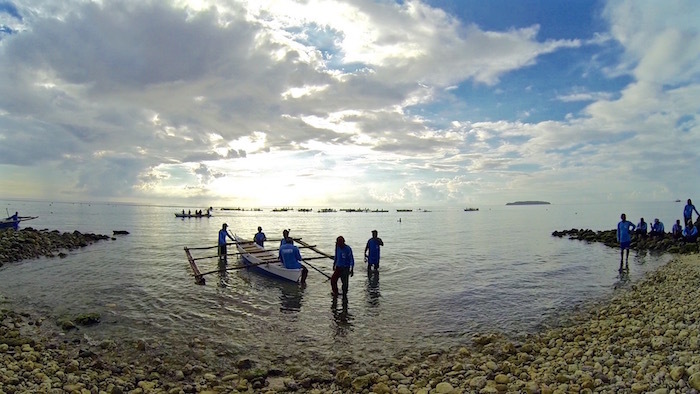 There are boats that go from Alona Beach to Oslob. When we were there they had boats running at least once a day and also private hire boats (which are more expensive). When you arrive to Bohol just head to the Alona Beach area and you’ll find the boat info. Have a great trip. 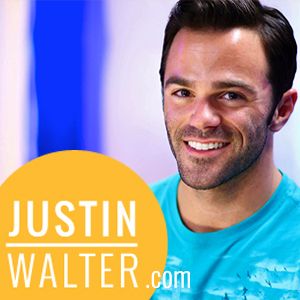 Great post, Justin! 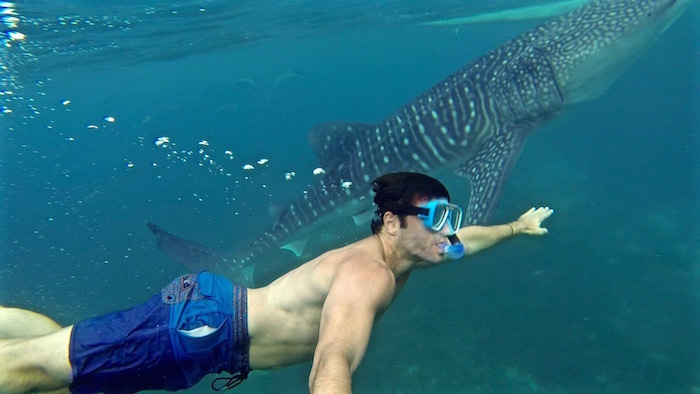 It is amazing to know that you can be really be close to these docile whale sharks. 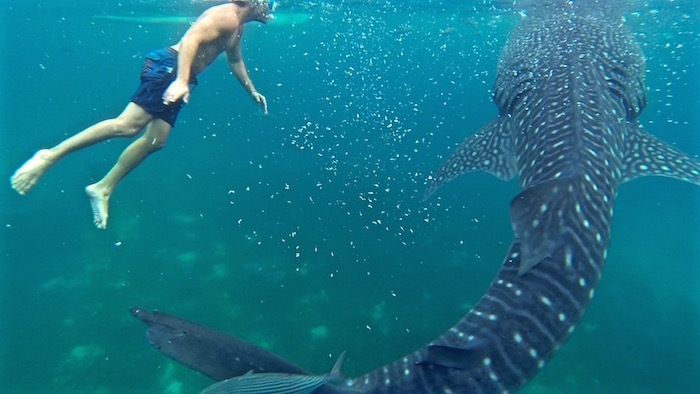 Thank you for sharing this beautiful pictures and experience you have with Oslob whale sharks. Keep on blogging! Thank you! 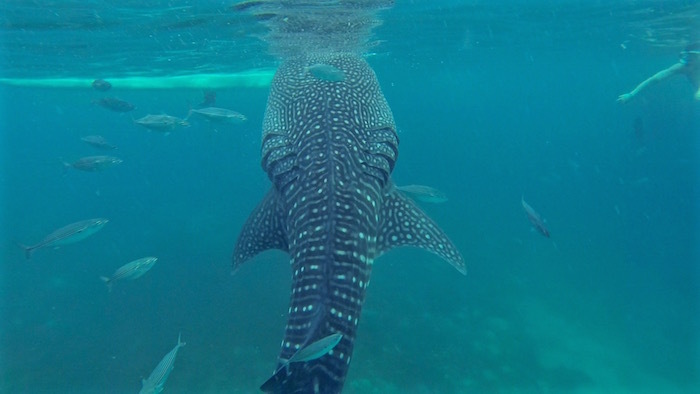 They are truly beautiful creatures and such a special experience swimming near them.